So, Earth Day has come and gone. Over a month later, you’ve helped clean up the shore line, pulled invasive species at the local park, and attended a fundraiser for fracking awareness. You’re feeling pretty good about things, and then you get home. The garbage is piled high, and you’ve got newspapers and scraps of old computer paper just lying around the office. You wonder, how can I clean up my mess, and help make Earth Day every day at the same time? The answer, my friend, is composting. 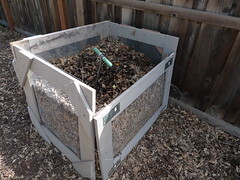 Many people think compost is hard, but the key is to maintain a good mix of the green, (like grass), with the brown, (ashes, coffee grounds, etc.) Grass will provide the nitrogen, and the brown items will provide the carbon. A little of each, well mixed, will break down more quickly and provide the best blend of nutrients for your soil. Anything that has been living is good to add to a compost pile, but avoid pet droppings or meat scraps, as these will attract unwanted pests. The great thing about this rule is, this includes paper products! Just be sure to shred any newspapers or junk mail up really well before you add them. See? You get to clean up your house, AND provide a nutrient rich soil for your vegetables and flowers. Everyone wins! Need help getting started? Not sure what to plant after you lay your compost, or how? Give Algiere’s a call, we are here to help with all of your spring gardening and landscaping needs! This entry was posted in Uncategorized and tagged Compost, Earth Day, Garden, Home, Organic matter, PH, Soil, Soil and Additives on June 3, 2013 by mspetersonexplains.